Foods rich in zinc and selenium can be found in any supermarket. First and foremost is the seafood, various meats, some types of cereals, nuts, vegetables and fruits. What foods are good for prostate? 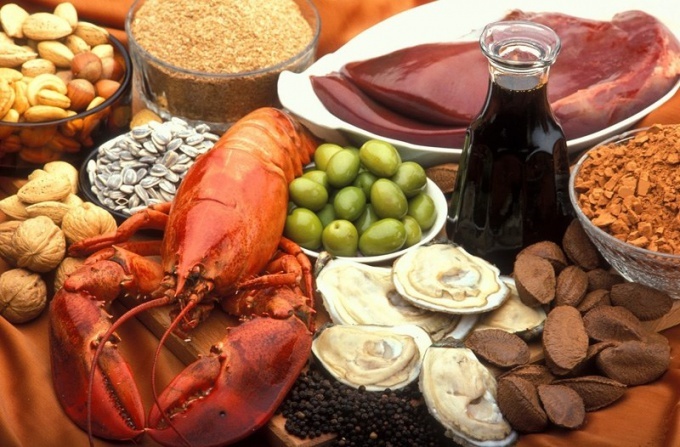 Most of the zinc is present in seafood, beef, yeast, nuts and seeds. It is the undisputed leader on the content of the element number reaches 7-10 mg per 100 g of product. The content of zinc in foods of plant origin depends on its content in the soil in which they were grown. Therefore, greenhouse vegetables often do not contain the required amount of zinc. The most zinc-rich foods (in descending order): seafood, especially oysters, shrimp, and mussels; fresh fish; sesame seeds; pumpkin seeds; brewer's yeast and baking; ginger root; peanuts; beef (sirloin); beef offal (especially the heart); chicken offal. The high selenium content in foods of animal origin and "seafood" although heat processing destroys this valuable item. But even after exposure to high temperatures in the seafood and pork liver preserved impressive reserves of selenium. A little less of selenium found in eggs, nuts, cereals. A selenium-enriched seafood; fillet and liver of marine fish; pork liver; beef offal (heart, liver, lungs); the liver birds (ducks, chickens, turkeys); eggs; brewer's and Baker's yeast; Brazil nuts; pistachio; corn, cooked in any way. Smaller amounts of selenium contained in wheat bran, wheat, brown rice, flour, meal, rye bread. From the berries of the most rich in selenium Rowan, black currant, wild strawberries and blueberries, greens – garlic sprouts, fennel, asparagus, celery (especially the root). Mushrooms also contain selenium, but only in the case that grow in soil containing a sufficient amount of this element. Do not forget about such an accessible source of selenium like sea salt. A small supply of copper is contained directly in the body: liver, kidneys, heart, blood, brain, muscles – a total of 100-150 mg. every Person must replenish the supply of copper at 2 mg. Nature took care of its replacement through food and herbs. But there are products, the use of which reduces the level of copper in the body to critical. You need to choose the products containing this metal and reduce impeding its absorption. The most available source of copper for humans cereals. Leaders in its content are considered as buckwheat, oats, millet, barley groats. Just below the metal content of rice and wheat grains. Favorite pasta, especially made from durum wheat, a larger copper content of all types of cereals. Another product with rich content of useful metal products. Beef and pork liver, kidneys, heart, brains contain copper in five to ten times more than cereals. However, chicken liver contains copper, ten times less than in beef. Copper in large quantities is contained in seafood. Consumption of squid, octopus, shrimp is very useful for filling the body with salts and metals. In beans the milk stage copper and other minerals contains much more than in ripe beans. A good source of copper and other metals are legumes and vegetables. Peas, chickpeas, beans and popular in recent lentils can be cooked first and second courses with a high content of copper. Useful to replenish an important element of potato, cooked with skin, pumpkin dishes, and eggplant, asparagus, lettuce, tomatoes, radishes, turnips, radish. Dozen foods with the highest copper content (in 100 g): cod liver oil (13.5 mg), cocoa powder (4,55 mg), beef liver (3.8 mg), squid (1.5 mg), peas (0,75), pasta (0,70 mg), buckwheat (0,63 mg), walnuts (0.53 mg), oatmeal (0,50 mg), bovine kidney and heart (0.45 mg). A lot of copper contain black currant, cherry, strawberry, raspberry and BlackBerry. Copper and magnesium are seeds apples so that you can swallow with the use of a pair of bones together with a slice of Apple. Delicious and important for the replenishment of copper cranberry, watermelon, peach, pineapple. It is worth noting the high content of this metal in the nuts. Especially a lot of copper in walnuts and hazelnuts. Nature always takes care of us, providing everything to maintain the body in good condition. No exception is forest products with copper content. In the first place, any wild mushrooms, especially white button mushrooms. You can maintain the amount of copper in the body prepared for the winter rose, bird cherry, hawthorn, any wild berries growing in your area. Many medicinal herbs are able to maintain the level of copper: sweet clover, wormwood, yarrow, chamomile, St. John's wort, oregano. From these, you can prepare infusions and decoctions. Summer is useful to collect dandelion leaves and add to the usual salads, like fennel, which is also in the list of plants with a high content of copper. A lot of copper in roots and leaves of ginseng, but its use should be very careful. If you need to increase the content of copper, it is better to abstain for some time from preparations with vitamin C and foods with added fructose. Interfere with the absorption of copper the usual eggs and dairy products. Milk protein casein and a protein in eggs, resist the accumulation of this metal. Hinder the absorption of copper in alcoholic drinks. But in beer, a present which is brewed from barley, copper very much. Therefore, it is better to replace the vodka with a small amount of "live" beer. Main conclusion: try your menu to be tailored to the compatibility of ingredients. Elaborate optimal diet allows you to enter in the menu of compatible products with the highest rates of digestibility of nutrients, salts and minerals. This will significantly improve health and reduce the need to resort to buying of vitamin preparations. Advice 3 : How to compensate for the deficiency of copper in the body? Copper is very important for the formation of red blood cells, synthesis of hemoglobin and myoglobin. She also contributes to the normal functioning of the respiratory and nervous systems, involved in protein synthesis. With the consumption of copper should be careful, because the body's need for this mineral in the normal state is not so great. The daily rate ranges from 1.5 to 3 mg. The excess copper leads to equally serious consequences, than its lack. You experience mental disturbances and even seizures. In the presence of various diseases and pregnancy, alcoholism, the need for copper increased significantly. Copper deficiency in the body can be recognize the totality of characteristic symptoms. This interferes with the synthesis of the pigment in the skin and the hair, the hair starts to fall intensely. Anemia, of appetite, disturbed digestion. Worsens respiratory system and skin. The characteristic skin rash. The person becomes boring and prone to depressive States, reduced immunity. To avoid these ailments, you need to get enough copper from food. In a normal varied diet the problem of shortage of copper practically does not occur. Be aware that alcohol consumption causes a shortage. A leader in the content of copper is the liver of fish: cod and Pollock. These products contain about 10 mg of copper per 100g, which abundantly covers the daily requirement for an adult. You should control your consumption of these foods because of the high content of copper can easily lead to an excess in the body. Further, it is worth to pay attention to some types of nuts and legumes. Peanuts and hazelnuts contain about 1.15 mg of copper per 100g, while the pea – 0.75 mg. Pistachios and walnuts are somewhat behind on this indicator, with about 0.5 mg per 100 g.
Copper contain many seafood. In shrimp it contains more than nuts and legumes. The octopus meat content of copper reaches 0,435 mg per 100 g of product, in the meat of squid is 1.5 mg per 100g. Also enough copper is found in many cereal crops, an average of about 0.5 mg per 100g. Among them, buckwheat, lentil, rice, wheat. Copper-rich cereal and also beans. A small number also contain copper and some fruits. Among them apricots and pears, 100 g which is approximately 0.1 mg of copper.